Includes an historical look at the use of edible insects in indigenous cultures. Provides information on where to obtain insects and how to store and prepare them. Includes over 60 gourmet recipes, complete with stunning color photographs. The most wholesome source of protein on earth cannot be found in any supermarket in the United States, but it can be found right in your backyard! Insects have been a staple food of almost every indigenous culture, not only because of their delicious flavor but also because they provide a more complete protein than soy, meat, or fish, and are concentrated sources of calcium, niacin, magnesium, potassium, the B-vitamins, and many other nutrients. As the world heads for food shortages in the next century insects can help meet humanity's growing nutritional needs. Creepy Crawly Cuisine tells you everything you need to know to make insects a part of your diet. It includes an overview of the use of edible insects by indigenous cultures, information on where to obtain insects and how to store and prepare them, and over 60 gourmet recipes, complete with stunning color photographs, that let you take the cooking of insects to dazzling culinary heights. 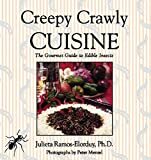 As practical as it is unique, Creepy Crawly Cuisine is the ideal gift for followers of the Diet for a Small Planet, adventurous epicures, and cooks who think they have seen it all.